IIT Indore confocal microscopy facility is located at sophisticated instrument center (SIC) building, Simrol campus, IIT Indore. The facility has a state of the art imaging system capable of fluorescence confocal laser scanning microscopy, two-photon laser scanning microscopy, fluorescence lifetime imaging microscopy (FLIM), fluorescence correlation spectroscopy (FCS). 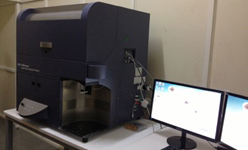 The microscope is fitted with Mai Tai DeepSee femtosecond tunable laser. IIT Indore Flow Cytometry Facility is located at Simrol campus, IIT Indore. The facility has the state of the art Flow Cytometry Sorter (4 laser system) and Analyser (5 laser system). BD FACSARIA III - 4 laser bench top fixed aligned sorter system with pre-aligned fixed solid state lasers 488 nm, 640 nm, 405 nm, and 561 nm. The system can analyse 13 parameters: - forward scatter, side scatter and 11 colors / fluorescence detectors. It allows two & four way sorting into 12 x 75-mm, and 15 mL tubes. The system contains an automated cell deposition unit (ACDU) module that provides automated sorting into 6, 24, 48, 96, and 384-well plates and slides. Sample injection chamber allows various sample input tubes, including microtubes, 12 x 75-mm, and 15 ml tubes. Nozzle sizes available are 70, 85, 100, and 130-micron. The system is placed in a ClassII A2 bio-safety cabinet with a kill unit, which enables sample and user safety. BD LSRFortessa - 5 laser multi-color high speed analyser with fixed optical bench with pre-aligned FIVE fixed lasers (Blue Laser: 488nm, red laser: 640nm, violet laser: 405nm, yellow green: 561nm, near infra red laser: 785 nm). The system can analyse 20 parameters: - forward scatter, side scatter and 18 colors / fluorescence detectors. All the five lasers can be used simultaneously. System is capable to acquire up to 40,000 events/Sec and fluorescence sensitivity is as follows FITC-80, PE-30, PE-Cy™5: 10, APC: 70 MESF. The facility currently offers cell sorting services 5 days a week (Monday through Friday) during the hours of 9 AM to 5 PM. Cell sorting: High speed cell sorters have the capability to not just analyze the fluorescence and light scattering characteristics of cells, but also to physically fractionate the heterogeneous cell sample into as many as 4 highly purified populations, one cell at a time. Multi-color high speed analyser: Bench-top analyser will analyze cells without sorting them. The cells make one pass through the instrument and then are sent to the waste container. Post-acquisition data interpretation and analysis. IIT Indore Proteomics Facility is situated at Simrol campus, IIT Indore. 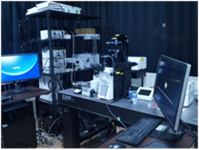 Proteomics facility has equipped with AKTA Pure 25, Ettan IPGphor 3 Isoelectric Focusing Unit and Image Quant LAS 4000 System. 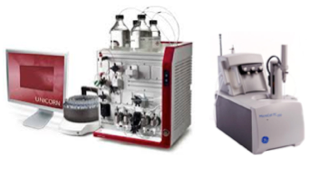 ÄKTA pure chromatography systems are flexible and intuitive and enable fast purification of proteins, peptides, and nucleic acids, from microgram to tens of grams of target products. The AKTA pure system is used to purify proteins from natural or recombinant source using a number of different techniques. Recombinant protein which can be tagged and un-tagged proteins can be isolated using techniques such as Gel Filtration Chromatography, Ion Exchange Chromatography, Hydrophobic Interaction Chromatography, and various forms of Affinity Chromatography. ÄKTA pure can be tailored to a broad selection of hardware options from valves and tubing to monitors and fraction collectors. UNICORN control software can also be customized by addition of optional functionality such as Design of Experiments (DoE) for enhanced method optimization. The Ettan IPGphor 3 is a fully integrated isoelectric focusing (IEF) system optimized to deliver speed and reliability in the first dimension of 2-D electrophoresis. Large alphanumeric graphical display accommodates up to four lines of text for fast and easy programming. In the Ettan IPGphor 3 up to ten protocols (nine steps each) can be saved, retrieved and easily edited. Temperature control for the Ettan IPGphor 3 is from 15° to 31°C. 12 IPG strips (7, 11, 13, 18, or 24cm) can be run simultaneously. Software can generate professional graphical reports with large user interface for programming and editing. The Image Quant LAS 4000 a sensitive and robust imager for chemiluminescence, UV transillumination, and UV fluorescence analysis of protein and DNA samples in gels and membranes. The instrument has Peltier cooled CCD, White Epi light, UV transillumination light. Characterization of molecular interactions of small molecules, proteins, antibodies, nucleic acids, lipids and other biomolecules. Synergy™ H1 is a flexible Monochromator-based multi-mode microplate reader that can be turned into a high-performance patented Hybrid system with the addition of a filter-based optical module. This system supports top and bottom fluorescence intensity, UV-visible absorbance and high performance luminescence detection. The filter module is a completely independent add-on that includes its own light source, and a high performance dichroic-based wavelength selection system. The system has very high optical efficiency; this module supports advanced detection modes such as Fluorescence Polarization, Time-Resolved Fluorescence & TR-FRET and filtered luminescence (e.g. BRET). This system is also compatible with Take3™ Micro-Volume Plate in which samples down to 2 µL volume can be measured, especially useful when working with precious samples, for fast and accurate DNA/RNA quantification at 260 nm. Discovery Studio (DS) is Accelrys’ comprehensive predictive science application for the proteomics study. DS can be used to investigate and test hypotheses In-Silico prior to costly experimental implementation, thus reducing the time and expense involved in bringing products to market. It drives scientific exploration from target identification to lead optimization with a range of protein size for the modeling and molecular dynamics simulation. It is highly optimized for the high-through put screening with macromolecule against a large database.